Being a condo-dweller himself and part of the growing population of "YUP-pies," or simply young urban Pinoys, Erwan Heussaff have collaborated with Philips, producing a couple of videos showing how easy-breezy it is to whip up what you think may seem to be a recipe that's hard to follow. 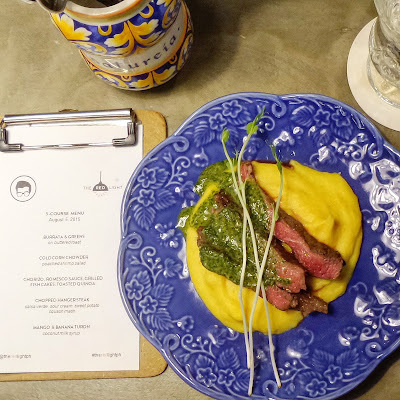 An intimate dinner was organized for a couple of media guests at Erwan's bar and kitchen in "the red light district of Makati" - The Red Light. Though, it wasn't just a dinner, it was a gorgeous kinda one, as The Fat Kid Inside was the one who hosted, prepped and even served us a five-course dinner. With a twinged pointed finger, he was able to keep everything near perfect, if not perfect. This hunk, cool as a cucumber, delegated in the kitchen heat was able to give us key points in living healthy, enjoying food, and what it would make for a perfect dinner at the comfort of one's condo or apartment. While living in a condo has its perks, there are also quite a lot of limitations. The average condo unit size in Manila is around 50 sqm, not enough space really to host a stunning and welcoming party right? Here are some tips from Philips addressing such concerns in arranging a memorable condo dinner party. Planning ahead is the key. I've been an event organizer for years now, and having details of the event well-thought of and planned, made the event successful and really manageable. First, think of these items in your list: theme of the party, who's the guests, when and exactly where in your condo do you want to have the party, and specially the menu. Here's a copy of Erwan's menu for the night. Seeing the menu, in a cook's perspective might make you smirk or can give you quite a shock. But believe me, Erwan made it in less than two-hours and served a gang of hungry people with a lovely smile. Some of the things you may need to consider as well are the food that will make your guests enjoy the dinner or party, like which food or cuisine would they prefer, and don't forget certain allergies to food they may have as well. If you can't think of something, or perhaps adamant to try something new, you may want to check out some of Erwan's YouTube videos using Philips very helpful kitchen gadget, the Digital Airfryer with Rapid Air technology. On the same You tube channel are other videos where Erwan cooked with Philip's Airfryer. 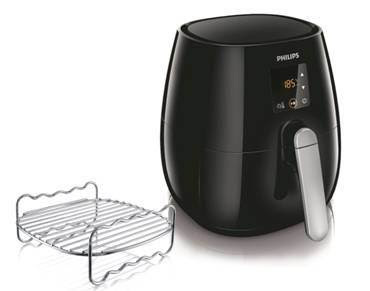 Powered by Rapid Air Technology, the Philips Airfryer uses an integrated filter and super heated air instead of oil to cook. It cuts down cholesterol and removes up to 80% of fat, while leaving food wonderfully crispy outside and amazingly tender inside. What’s more, it can be used to roast, bake, and gratinate a wide array of dishes. This low fat fryer is spacious enough to accommodate layers of food and even a whole chicken inside its basket. Furthermore, it is very sleek and not heavy so it can be easily placed at one corner of your kitchen. Perhaps you've been dreaming of that sleek kitchen which you can show off to your guests, but in reality most of the condos are modest in size, you might not fit an oven and a dishwasher at the same time. Even Erwan said his condo kitchen is also small, that's why they've set up The Red Light's kitchen to accommodate their video shoots. "The Red Light is basically a collaborative kitchen venue, where we would do fund-raising dinners, project collaborations and for me to cook for more friends." Preparing dinner meals can be such a chore, a party even more, so Erwan suggested some of the Philip's kitchen appliances he have at his condo. Apart from the Philips Airfryer, he also likes using Philips Food processor, where he makes sauces, dips and even desserts with it. A regular help with his daily diet is with Philips Hand Blender which he calls stick blender. At The Red Light, on one corner, you can chance upon several Philips products from their Viva Collection, and try to spot the Slow Juicer on the bunch. With all the help you get from Philips kitchen line, cooking would be a wonderful experience, even if you're a woman or a man on apron. Here are the deets on our gourmet dinner sponsored by Philips at The Red Light. Compared to other restaurants or bars with recessed or ambient lighting, here the light fixtures wasn't only a architecturally-pleasing, the light was really impressive, perfect for that IG shot. Plus you can easily spot a flaw on what you are making, I'm thinking the people behind this concept resto also thought of all these details. I've learned a lot from him really, he knows his way around the kitchen but mind you, he's not a chef. He was first known as Solenn's brother who have a famous blog, The Fat Kid Inside. But more than a food and health enthusiast, Erwan also is a businessman who holds a degree in Business and Hospitality Management from the EMC Campus, CMH in Paris. Along with Hatch 22, Crisp on the 28th and The Red Light, he serves as the Creative and Operations Development Partner for 4 more restaurants, his newest venture, Sprout, is a healthy alternative meal on take-out boxes. We all were arm's length near to Erwan and most of us were star-struck. He was such a gentleman accommodating all our questions, some even with their eetsy-bitsy favor for their taste preferences. After wiping clean all the first batch of plates with paper towels, he proceeded lining them up accordingly on his workstation, He took some sliced bread over the cooking station and toasted some slices on a pan with olive oil. One by one, he placed the toast on all the lined plates for our first course- Burrata and Greens. while he talked about how Burrata was made. Seeing him arrange all the plates with ease, I told myself, it's all about prepping ahead and micro-managing. Next dish was Cold Corn Chowder. Roasted corn was osterized together with some spices and sieved through a funnel-like sifter. After grilling the seasoned medium-sized shrimps, he ladled the cold concoction onto the white soup bowls, topped one shrimp on each and garnished with fresh greens from Bukidnon. Lastly, he carefully sprinkled rock salt on them. Yes, aside from cooking our food, he also served them one by one. The butter sauce from the shrimp gave the soup added appeal and depth of flavor. The creaminess of the soup is so comforting sans the warmth from every sip. Cold soups may be not for everyone, I'm a big fan of soups, cold or hot, so this easily won me. My plate is so romantic, as if so much love was put into it, (kemme lang..wish ko lang my husband can also work out something to present me his cooking in this way). This beautiful red plate has Chorizo, Romesco sauce, toasted Quinoa, grilled fishcakes and some baby shrooms with mild chili sauce. Now, I'm really pushing myself to buy me next Philips Food Processor so I can make my own Romesco sauce, it's the thick yellow mash on the side. Why I want the Philips Viva collection Food Processor? Powerchop Technology, the combination of blade shape, cutting angle and inner bowl that provides a superior chopping result in both soft and hard ingredients. Erwan was so agile and his focus to what he's doing is impressive and how I wish I could get infected with his kitchen attitude. Still finishing what's on my red plate (I swear, I could have licked it clean, as the romesco was so comforting-good) Erwan went back to the grill and started firing it up. Chopped Hangersteak glorified with salsa verde on a bed of sour cream sweet potato squash mash. I simply couldn't resist this steak done the way I love it and with ample topping of salsa verde. See how smooth, thick yet lump free the mash was. The taste was even lovely, it's not that sweet as you would think getting it from both sweet potato and squash. The sour cream probably made the savory difference. Every details were a bit important, see how he picked the mint leaves himself to garnish our dessert. I thought the night wouldn't end, for it was such a delight seeing a guy as handsome as he is, cooking, plating and serving, while he endlessly and carefully talks to us. Our last plate- dessert, Banana Guyabano Flambe with Coconut Milk Syrup. By this time we were all imbued and this served as a palate cleanser, the caramel flavor achieved from browning the banana in olive oil fairly meshed with the tangy guyabano meat and the creamy coconut milk froth. I've never really thought of cooking with guyabano and adding it even to banana, something new, though I never like the bitter aftertaste you get from it. Just like that, an event worth remembering, you can also have this kind of dinner at The Red Light, check out their Facebook and Instagram feeds for updates on their upcoming Test Kitchen segments. Time now to check the difference of cooking with Philips, even though I don't really live in a condo, but sure is nice to have friends and relatives come over and taste new dishes I've been meaning to prepare.